I really want one of these! Today only this Bissell BarkBath Portable Dog Bath System is just $99.99 (Reg. $149.99)! Now there is a faster, easier and less messy way to bathe your dog! 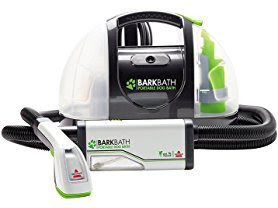 The BISSELL BarkBath is portable and allows you to give your dog a bath anywhere in the house without having to get near a tub or outdoor hose. The specially designed nozzles go beneath the fur to wash from the skin up while soft suction pulls water, dirt and odors away. Welcome to the next generation of bathing your dog. Note – Sound/noise emitted is similar to a vacuum. For best results, your dog should not be afraid of the sound of a vacuum. Training steps are provided in the user guide materials to acclimate noise-sensitive and anxious dogs.